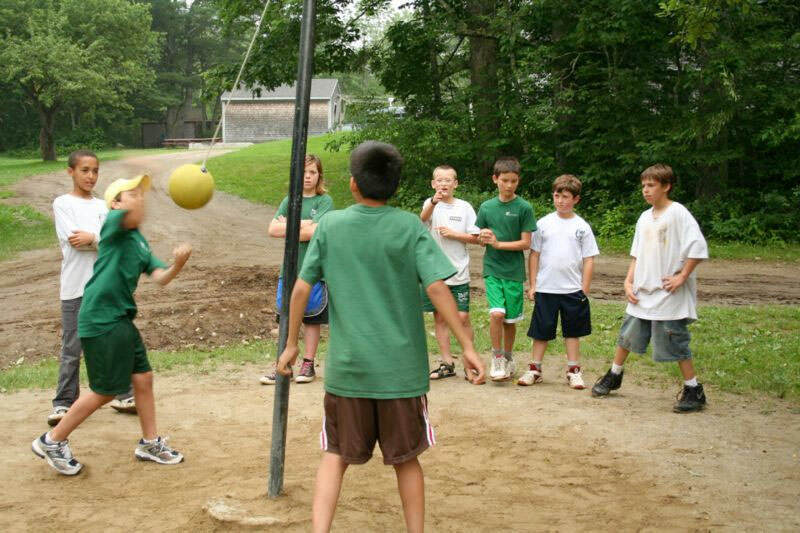 If you grew up on or around almost any playground in America, chances are you are familiar with the game of tetherball. For decades now, children—and adults—throughout the United States have racked up hundreds and hundreds of collective hours on the tetherball court, pounding the round ball repeatedly in an effort to wind the ball around the pole as their opponent strives to do the same, and hopefully take out all the slack on the rope for the eventual win. Whether the pole is cemented to the ground or to an old tire of some kind, the game of tetherball offers a bounty of fun and one-on-one excitement, while also providing cardiovascular exercise for millions of children every day. Unlike the tetherballs of old, which were hard and often uncomfortable to strike, today’s tetherball sets come with softer balls, stronger ropes and plenty of options in terms of where to place the pole. To help you select the perfect set for your backyard or patio, below we have reviewed several of the most popular and best-selling tetherball sets currently on the market, and listed the pros and cons associated with each product. 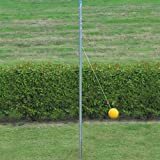 We have also compiled a Tetherball Set Buying Guide, in which we will outline and explain some of the factors to consider—and characteristics to look for—when purchasing one of these fun backyard products. BSN Outdoor Tetherball Set – top pick for quality! Park & Sun Sports Permanent Outdoor Tetherball Set – top value pick! The BSN Outdoor Tetherball Set comes with galvanized steel poles and a construction that promotes the stability and durability to withstand outdoor use. The two-piece pole setup combines to form a stable pole that stands at a whopping 12 feet—the regulation height for playground tetherball setups. The poles are designed to be “permanently” installed two feet into the ground. According to the manufacturer, this reduces the risk of the pole tipping or falling, making it much safer for children. And our editors think that this is the best permanent tetherball set on the market right now! 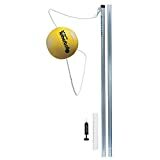 Also included in the BSN Outdoor Tetherball Set is the top eye-bolt that connects the rope to the top of the pole. The rope/cord is made from heavy duty nylon to withstand hours upon hours of repetitive swinging/hitting. A tetherball, with a nylon cover, is also included in the set. Keep in mind, this setup will require cement to secure the pole into the ground—preferably on a hard surface. Users can also install the pole to an old tire in the event they may want to move the court from one place to another. Sturdy poles. Designed to be secured 2 feet underground with cement, the galvanized steel poles in the BSN Outdoor Tetherball Set are some of the strongest in the industry. Top-eye included. A permanent top-eye bolt is included with the BSN Outdoor Tetherball Set. Regulation height. The poles in this set are not only durable enough for school use; they also stand at the regulation height for competitive tetherball. Permanent. The most “permanent” of all the sets we reviewed, the BSN Outdoor Tetherball Set cannot be disassembled when erected. Premium priced. Because this is a regulation, permanent tetherball set, it may not be suitable for the budget-conscious. 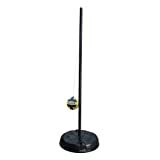 As the name suggests, the Park & Sun Sports Permanent Outdoor Tetherball Set includes a pole that can be anchored permanently in the ground, to an old tire or some other heavy structure. The two-piece poles, which are made of galvanized steel and measure 1-5/8 inches in diameter, are linked together by a push-button pole locking system, which measurably speeds up the assembly and breakdown time. The galvanized steel from which these poles are made not only offer incredible stability and durability, the material also resists rusting and oxidation, ensuring your poles will remain strong through all weather conditions. Our editors think that makes this one of the best in-ground tetherball sets at a budget price right now. When fully assembled, the pole stands at 10 feet 3 inches, making it perfect for players of all ages. The ball that is included with the Park & Sun Sports Permanent Outdoor Tetherball Set is very soft to the touch. It features a nylon-wound bladder and a valve stem that is set deep within the ball, ensuring no hands can be cut or scraped by it. The ball is attached to the rope or cord via a durable internal swivel hook attachment that is guaranteed to keep the ball firmly secured. The long lasting and very soft synthetic material that is used to make the ball greatly mitigates the impact to hands, wrists and arms when struck; and the 7-inch, 6 millimeter diameter cord is made of tough nylon that will last as long as the poles. The set includes a 12 inch in-ground sleeve for easy setup; and a compact hand pump with two inflation needles to keep the air pressure (PSI) in the ball at the correct setting. Galvanized steel poles. The Park & Sun Sports Permanent Outdoor Tetherball Set comes with poles made of tough galvanized steel that resist rusting. Soft ball. The soft nylon ball helps lessen the arm and hand impact with this tetherball set when the ball is struck. Pump included. A handy air pump and two inflation needles are included with the Park & Sun Sports Permanent Outdoor Tetherball Set. Permanent. Although some may see this as a positive, the permanent nature of the Park & Sun Sports Permanent Outdoor Tetherball Set means it cannot be moved once set (unless you use and old tire to mount it). Ball can deflate during use. According to some players, the ball that comes with this tetherball set may deflate easily. One of the most popular sets currently on the market, the Baden Champions Series Tetherball Set has everything you need to assemble the court and play. The awesome set includes a three-piece pole system, all of which are made using the toughest powder coated steel. The powder coating not only makes the poles look great (a white color), it helps them resist oxidation that could otherwise break down the steel over time due to rain and other inclement weather. The set also includes the durable, yet soft-to-the-touch Baden Deluxe Tetherball, which is made of high-quality rubber and is built to withstand spirited play. The ball attaches to the touch nylon rope (also included) with the help of a strong steel eye bolt, making a connection that is almost impossible to break. The Baden Champions Series Tetherball Set is very easy to set up. 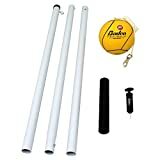 All you need to do is insert the 12-inch PVC plastic ground sleeve into a grassy area in your backyard; click the three lengths of the pole together and insert. When fully assembled, the pole rises to a height of 10 feet 5 inches, higher than most other sets on the market. An air pump with an inflation needle is also included, and the ball will first need to be pumped up to the correct PSI before playing. 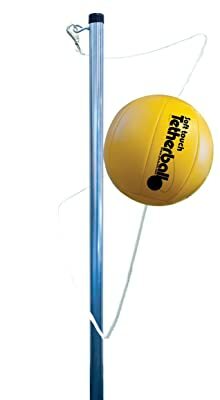 This top-of-the-line tetherball set is a great way to get kids—and adults—away from the TV, computer and video games, and instead engage in a raucous tetherball tournament that everyone will love. And when finished, just lift the pole out of the PVC sleeve, break it down, and store all of the pieces away until you are ready to play the next game. Powder-coated poles. The powder coated poles on the Baden Champions Series Tetherball Set helps it resist weather and rust. Temporary setup. 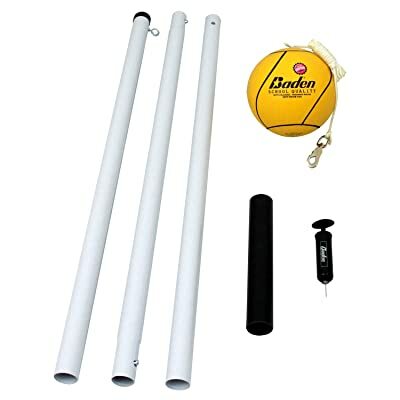 Thanks to the 12-inch PVC sleeve and the three-piece poles, the Baden Champions Series Tetherball Set can be setup and broken down with ease. Soft rubber ball. The Baden Deluxe tetherball that comes with this set is made from the softest rubber that gives upon impact to reduce irritation. Cord issues. According to some users, the nylon cord that comes with the Baden Champions Series Tetherball Set is not very durable. Pole a bit wobbly. Because the pole in the Baden Champions Series Tetherball Set is made of three pieces, it can be a bit wobbly. Tetherball sets come in many different shapes and sizes. So which tetherball set is right for you? To help you answer this question, below we have outlined several factors and characteristics to consider when buying one of these sets. 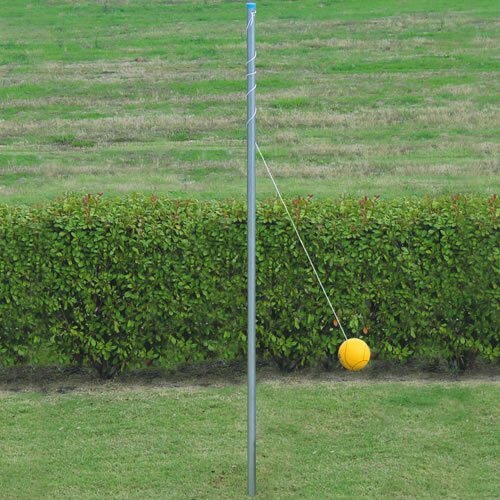 Permanent tetherball sets typically require the use of cement or concrete to set the poles into the ground. And once the poles are set, they cannot be removed. Permanent poles can also be set into an old tire, which gives you a bit more freedom of movement. Temporary sets usually come with a sleeve that is anchored into the ground. Into that sleeve, the two or three-piece poles are inserted, and these poles can be taken out and stored in the garage or a shed at the conclusion of the game. If you do not want a permanent pole in your backyard, we recommend one of the temporary setups with your tetherball set. However, keep in mind that these temporary sets are not near as durable as the permanent ones, and the poles are often much more wobbly and unstable. Tetherballs are available in many different materials. While most tetherball sets will include a ball with the package, not all of these balls are equal. If you are buying this set for smaller children, we recommend a rubber tetherball. These types of balls are softer to the touch and they won’t cause injury. Older children, who hit the ball harder, may benefit more from a harder nylon ball. These balls are much more durable than their rubber counterparts and tend to stay inflated longer. Whether you are buying a permanent or temporary tetherball set, be sure to look for one in which the nylon cord is included. This cord should be about 7 feet in length. It should also include the hardware to attach the cord to the ball; as well as the top eye bolt to connect the cord to the top of the tetherball pole. If you are going to spend money on a complete tetherball set, you should expect one with all the accessories. Two of the most important accessories are a compact air pump and inflation needle. In most cases, the tetherball in these sets will be deflated in the packaging, so you will need these accessories to start playing the game once the poles have been erected.